U.S.-Cubans living in Miami-Dade County in Florida now support U.S.-Cuba normalization. In addition, this survey also showed that 65% of the respondents supported changes in the Cuban Adjustment Act to require Cuban entrants to provide proof of political persecution before becoming eligible for government assistance. Just over 2 million people of Cuban origin reside in the U.S. today, 70% in Florida and mainly in the Miami-Dade area. Almost 1.2 million (57%) were born in Cuba and 47% of them spent more than 20 years living in that country, while nearly half (43%) were born in the United States. This reflects the decline in the proportion of first immigrants, those who arrived before 1980 who are the most hostile to normalization positions, as well as the proportional increase of their descendants and more recent immigrants. As reflected in the survey, 93% of those who arrived after 1995 and 87% of those between the ages of 18 and 39 support unrestricted travel to the island. Moreover, all descendants and 76% of more recent immigrants have U.S. citizenship and thus are potential voters in this year’s U.S. election. Santana, Majority of Cuban-Americans in Miami oppose U.S. embargo, FIU News (Sept. 14, 2016); Cervera, The consolidation of changes in the Cuban American community, CubaDebate (Sept. 17, 2016); Assoc. Press, Shifting Cuban Voters Could Be the Difference in Florida, N.Y. Times (Sept. 19, 2016). On May 16, in Havana the U.S.-Cuba Bilateral Commission held its third meeting to review the status of the countries’ efforts to normalize relations. The U.S. delegation was headed by Ambassador Kristie Kenney, currently serving as Counselor of the Department of State, who was assisted by John S. Creamer, Deputy Assistant Secretary of State, Bureau of Western Hemisphere Affairs, U.S. Department of State; and by U.S. Ambassador Jeffrey DeLaurentis, Chargé d’Affaires, U.S. Embassy, Havana, Cuba. 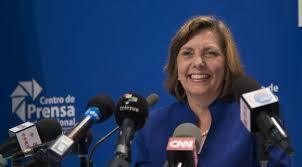 The Cuban delegation’s head was Josefina Vidal Ferreiro, the Director General of the Cuban Ministry of Foreign Affairs’ Department of the United States. At a press conference after the meeting, Director General Vidal said the meeting had been “productive” and conducted in a “professional climate of mutual respect.” (A photograph of Vidal at the press conference is on the left.) The parties agreed to hold the fourth meeting of the Bilateral Commission in September 2016 in Washington, D.C.
Vidal acknowledged that there has been an increase in official visits as well as technical meetings on topics of common interest resulting in nine bilateral agreements to expand beneficial cooperation. According to Vidal, both delegations agreed on steps that will improve relations, including conducting high-level visits and technical exchanges on environmental, hydrography, and implementation and enforcement of the law, including fighting trafficking in drugs and people, and immigration fraud. The two countries also are getting ready to conclude new agreements to cooperate in areas such as health, agriculture, meteorology, seismology, terrestrial protected areas, response to oil-spill pollution, fighting drug trafficking and search and rescue, among others. They also are ready to start a dialogue on intellectual property and continue those relating to climate change and regulations in force in the two countries in the economic and trade area. More specifically Vidal said Cuba had told the U.S. representative that in the last six months two American companies and one French company had been fined by the U.S. for maintaining links with Cuba while Cuba has had problems with 13 international banks’ closing accounts, denying money transfers or suspending all operations with Cuba. In addition, six service providers have ceased providing services to Cuban embassies and consulates in third countries (Turkey, Austria, Namibia and Canada). In addition, the Cuban delegation, said Vidal, had reaffirmed the need for the U.S. to return to Cuba the territory [allegedly] illegally occupied by the U.S. naval base in Guantanamo. It “is the only case of a military base in the world that is based in a territory leased in perpetuity, which is an anomaly from the point of view of international law. There is no similar example in the world and is the only instance of a military base in a foreign country against the will of the government and people of that country. U.S. programs designed to bring about changes in the economic, political and social system of Cuba. These U.S. policies, according to Vidal, underscored “a huge contradiction” for the U.S. On the one hand, President Obama said in his speech in Cuba that the U.S. has neither the intention nor the ability to bring about change in Cuba and that in any case it was up to the people of Cuba to make their own decisions. On the other hand, the U.S. has programs with huge budgets ($20 million dollars every year) aimed at bringing about such change. If indeed there is neither the intention nor the ability to bring about change in Cuba, then there is no reason to have such programs. Normalization, said Vidal, also needs to have protection of rights to trademarks and patents because there are Cuban companies owning well-known marks, which for reasons of the blockade and other reasons have been taken away from the Cubans. Before the meeting, another Cuban Foreign Ministry official said that the parties previously had discussed, but not negotiated, with respect to Cuba’s claim for damages with respect to the U.S. embargo and the U.S. claims for compensation for property expropriated by the Cuban government. At the meeting itself, according to a Cuban statement, the Cubans had delivered a list of its most recent alleged damages from the blockade (embargo). Since the actual meeting was conducted in secret, it is difficult to assess what was actually accomplished except through officials’ subsequent public comments. On May 17, the two countries conducted their second Law Enforcement Dialogue, which will be discussed in a subsequent post. U.S. Department of State, United States and Cuba to Hold Third Bilateral Commission Meeting in Havana, Cuba (May 12, 2016); Gomez, MINREX: relations between Cuba and the United States would advance more nonblocking, Granma (May 12, 2016); Reuters, Cuba and U.S. Officials to Meet Next Week to Deepen Detente, N.Y. Times (May 12, 2016); Francisco & Elizalde, Cuba-US Bilateral commission: a productive meeting, Josefina Vidal (+ Photos and Video), CubaDebate (May 16, 2016); Assoc. Press, Top Cuba Diplomat: Obama Trip Positive, Created Momentum, N.Y. Times (May 16, 2016); Reuters, Cuba and United States Draw Up Roadmap for Talks to Deepen Détente, N.Y. Times (May 16, 2016); Gomez, Cuba and the United States defines ambitious agenda for the coming months, Granma (May 16, 2016); U.S. Embassy, Havana, Cuba, Third Bilateral Commission Meeting in Havana (May 16, 2016); Press release issued by the Cuban delegation to the Third Meeting of the Cuba-U.S. Bilateral Commission, Granma (May 17, 2016); Cuba and U.S. set ambitious agenda for coming months, CubaDebate (May 17, 2016). Beforehand an official of Cuba’s Foreign Ministry said that since the December 2014 announcement of détente the parties had signed nine agreements covering the environment, email, navigation safety, agriculture and travel. In addition, the Telecommunications Company of Cuba (ETECSA) had signed agreements with three U.S. companies for cellular roaming in Cuba; a U.S. company (Starwood) had an agreement to manage several Cuban hotels; and the Carnival cruise lines had made a maiden voyage to the island. Prior posts have concurred in the Cuban requests for ending all of these U.S. programs and policies. See Topical List of Posts—Cuba. The major event of the first day (April 16) of the four-day Seventh Congress of the Communist Party of Cuba was the two-hour, live televised address by Raúl Castro, the First Secretary of its Central Committee (and also President and General of the Army). Most of this address concerned the country’s internal socio-economic and other issues, which will be covered in a subsequent post, while a prior post provided an overview of the Congress. This post will focus on his discussion of Cuba-U.S. relations. Here is what he had to say on that subject near the end of the speech along with this blogger’s reactions. Given the prior public positions of the Cuban government, Castro did not say anything new on the subject of Cuba-U.S. relations. As expressed in many earlier posts, I agree that the U.S. should end its embargo of Cuba, its special immigration policies regarding Cubans and its covert or “discreet” programs purportedly promoting democracy in Cuba. I also recognize that Cuba repeatedly has alleged that the U.S. occupation of Guantanamo Bay is illegal, but saying so does not make it so, and this blog has suggested that the dispute on this issue is unlikely to be resolved in discussions and negotiations, but instead should be submitted for resolution to an independent court like the International Court of Arbitration at the Hague along with any damage claims asserted by Cuba with respect to the embargo. Another point of disagreement with Castro is his assertion that the U.S. goal of Cuban regime change is the same, but that the means have changed. Yes, the U.S. vigorously advocates for the right of Cubans to elect their leaders by popular vote, for the right of Cubans to protest and demonstrate against the government and to express their opinions without arrest and arbitrary detention and for the empowerment of Cubans to engage in self-employment and business. If they had such rights, that might lead to changes in the Cuban economy and government, but those changes would be chosen by the Cuban people, not imposed upon them by the U.S.
 Congress documents will be submitted to a broad discussion, Granma (April 16, 2016); 7th Party Congress underway, Granma (April 16, 2016); Raúl Castro, Central Report to 7th Congress of Communist Party of Cuba, Granma (April 16, 2016) (text in original Spanish); Raúl Castro, Central Report to 7th Congress of Communist Party of Cuba, Granma (April 17, 2016) (text in English translation); Burnett, Raúl Castro Urges Cubans to Remain Alert to U.S. Efforts to Alter Communist System, N.Y. Times (April 16, 2016); Reuters, Castro Hardens Rhetoric, Warns Cubans to Be Alert to U.S. Intentions, N.Y. Times (April 16, 2016); Assoc. Press, Raul Castro Presents Grim Picture of Cuban Reforms, N.Y. Times (April 16, 2016); Torres, Raúl Castro proposes age limits on key jobs in CCP, Miami Herald (April 16, 2016);Raúl Castro derides US democracy in speech to Cuban Communist Party, Guardian (April 16, 2016); Editorial, Rhetoric and reality in Cuba, El Pais (April 17, 2016). Last November 8,000 Cuban migrants were stranded in Costa Rica on their journey to the U.S. after Nicaragua closed its borders with Costa Rica. This crisis eventually was resolved by a multilateral effort in that region to transport the migrants by plane and bus to the Mexico-U.S. border where they gained entry to the U.S. The last of such transfers occurred this March. Another part of the “solution” was Costa Rica’s closing its southern border to additional Cuban migrants coming from neighboring Panama. Now another similar crisis has erupted with over 3,500 Cuban migrants stranded in Panama and unable to enter Costa Rica. On April 13 an estimated 1,200 of the Cubans illegally entered Costa Rica after attacking one of its immigration offices at the border. On April 15, the Government of Costa Rica issued another statement about the situation. This statement reiterated the previous points and declared that “Costa Rica and Panama are working to find joint and sustainable international solutions” to this problem. Although invited to the Costa Rica meeting about the problem, Cuba did not attend, and no official Cuban statement on the matter has been found. To my amazement and regret, I have not found any response to this situation from the U.S. Government. However, prior posts have argued that the U.S. should terminate its ”dry feet” policy that allows Cubans automatic entry into the country without a visa when arriving by land as well as the U.S. Cuban Medical Personnel Parole Policy that grants such personnel parole into the U.S. These policies are based upon the obsolete U.S. notion that every Cuban leaving the island is escaping persecution. These recent problems in Central America provide another reason for the U.S. to terminate these programs. Our friends in Central and South America are being subjected to intolerable burdens from Cuban migrants and our friends also see what they regard as unfair harsh U.S. immigration policies for their people seeking to go to the U.S. when compared with the Cubans. This earlier crisis was discussed in these blog posts: Cubans in Central America Provide Cuba with an Opportunity To Reiterate Its Objections to U.S. Immigration Policies (Nov. 20, 2015); Update on Cuban Migrants in Central America (Nov. 27, 2015); Status of Cuban Migrants in Central America Still Unresolved (Dec. 11, 2015); Resolution of Problem of Cuban Migrants Stranded in Central America (Dec. 30, 2015). Meléndez, Costa Rica says its doors are closed to Cubans, Miami Herald (April 11, 2016); Costa Rica Foreign Ministry, Deputy Foreign Ministers Meeting in Costa Rica allowed constructive dialogue on the issue of migration flows (April 12, 2016); San Martin, Central American countries meet to resolve new Cuban migration wave, Miami Herald (April 12, 2106); Costa Rica Foreign Ministry, Declaration by the Government of Costa Rica to irregular entry of migrants (April 13, 2016); Assoc. Press, Migrants Force Way Into Costa Rica From Panama, N.Y. Times (April 13, 2016); Dyer, Costa Rica pushed greater regional cooperation on Cuba, African migration, Tico Times (April 13, 2016); Fernandez, Cuban migrants force their way across the Panama-Costa Rica border,Miami Herald (April 14, 2016); Costa Rica Foreign Ministry, Statement of the Government of Costa Rica to the attempt of massive influx of Cuban migrants (April 15, 2016). Panama Foreign Ministry, Panama reiterates concern over problems of Cuban migrants (April 15, 2016). Reuters, Castro Hardens Rhetoric, Warns Cubans to Be Alert to U.S. Intentions, N.Y. Times (April 16, 2016). Prior posts about special U.S. immigration laws for Cubans: New York Times Calls for End of U.S. Program for Special Immigration Relief for Cuba Medical Personnel (Nov. 23, 2014); U.S. and Cuba Fail To Resolve Complaints About U.S. Immigration Policies (Dec. 1, 2015); President Obama Should Exercise His Legal Authority To End U.S. Admission of Cubans Arriving with “Dry Feet” (Dec. 4, 2015); New York Times Calls for End to Special U.S. Immigration Programs for Cubans (Dec. 21, 2015); U.S. Ending Its Cuban Medical Personnel Parole Program? (Jan. 8, 2016).